PORTRAIT INFANT BABY SACK HAT WITH POM POMS IN LICORICE - GREAT PHOTO PROP! 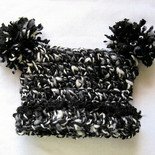 Sassy, sweet and stylish, this sack hat is crocheted from soft wool yarn in a blend of black and white. It has two funky pom poms and the brim can be left down or folded up for a different look. Perfect for your little one's portraits and makes a great gift too. CARE: I recommend hand washing in mild soap, shape and lay flat to dry. PORTRAIT INFANT BABY SACK HAT WITH POM POMS IN GOTHIC - GREAT PHOTO PROP!